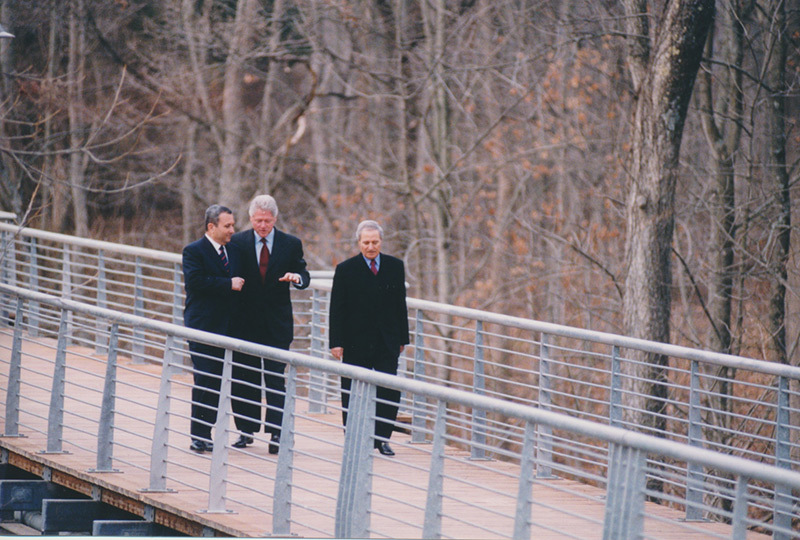 On January 3, 2000, President Bill Clinton, in an effort to end three decades of hostilities between Israel and Syria, convened a meeting of representatives of both countries in Shepherdstown. 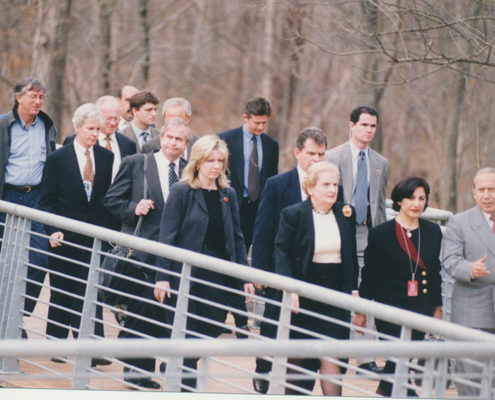 Shepherdstown was chosen because of its proximity to Washington, DC — close enough for officials to commute, yet far enough away to afford a more relaxed atmosphere for the negotiations. 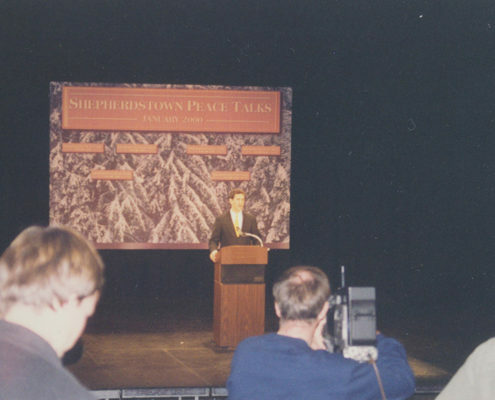 Venues for the talks included the Clarion Hotel, Shepherd University, and the National Conservation Training Center, located off Shepherd Grade Road. In preparation for the meeting, signs reading “Peace,” translated into Hebrew and Arabic, hung in shops and windows throughout the town. A local entrepreneur had printed up tee-shirts with a heart-shaped map of the world with Syria, Israel and Shepherdstown highlighted on the map. 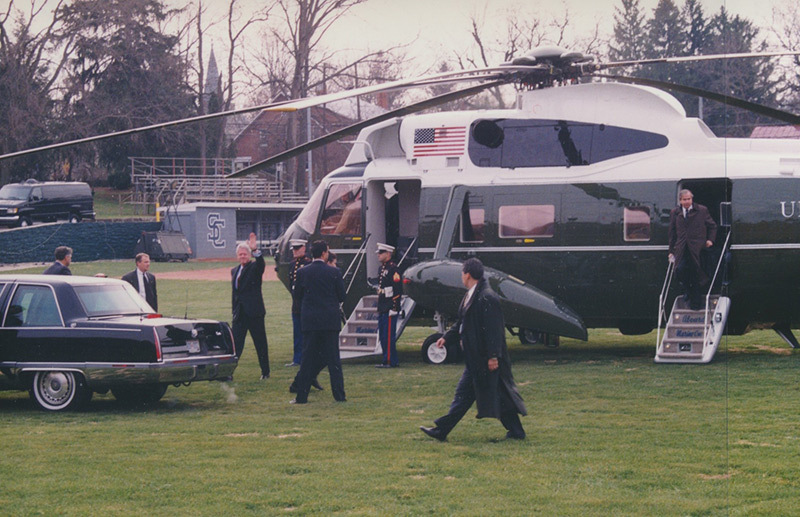 A crowd of about 50 residents cheered Clinton as he landed by helicopter at the Shepherd College ballfield. A few minutes before, the bells at Shepherdstown Presbyterian Church rang out, calling townspeople to a noon prayer vigil that would continue throughout the talks. The Israeli delegation was led by Prime Minister Ehud Barack, while Foreign Minister Farouk a-Shara was the chief negotiator for the Syrians. 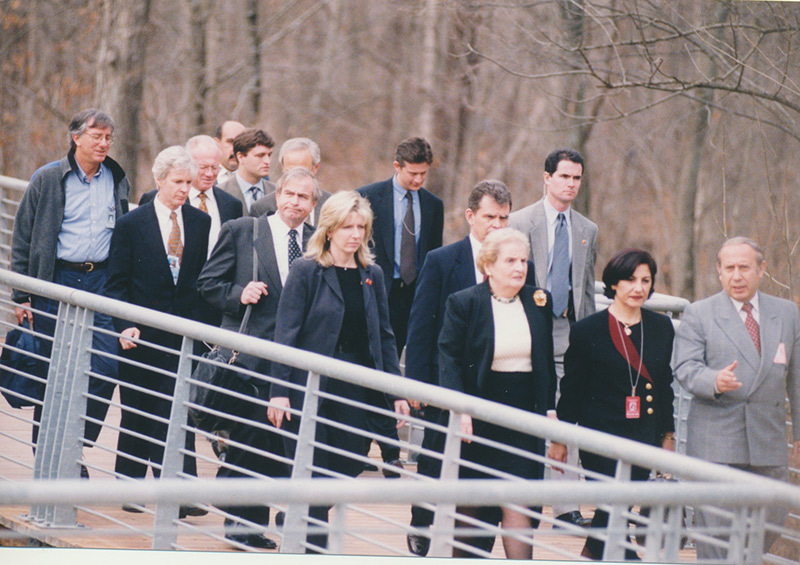 About 520 people – both sides having brought experts in the fields of law, science and geography — were involved in the “very high level” peace talks according to State Department spokesman, James Rubin, who spent the week in Shepherdstown and who was spotted one evening dining with Secretary of State, Madelaine K. Albright at the Yellow Brick Bank restaurant. Additionally, more than 100 federal and local law enforcement officers, some in uniform and some in plain clothes, could be seen around town. 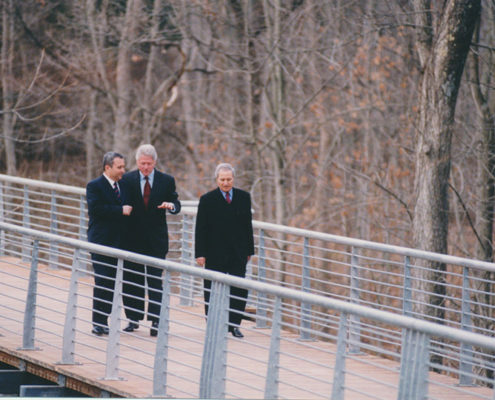 President Clinton made five trips to Shepherdstown that week. 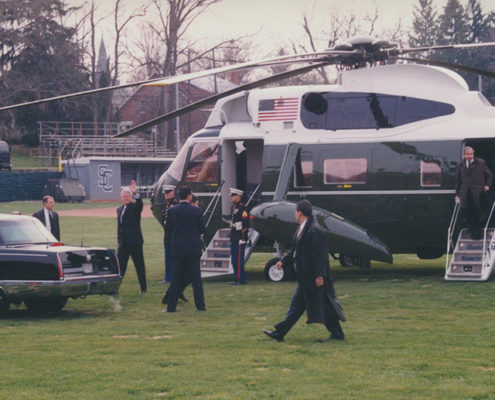 Newspaper accounts noted minor traffic jams at the four-way stop sign or on Shepherd Grade Road as the presidential motorcade made its way to the Clarion Hotel or the National Conservation Training Center. Even though both sides agreed to return to the negotiating table later that month, there were no further meetings and no peace agreement was ever reached. 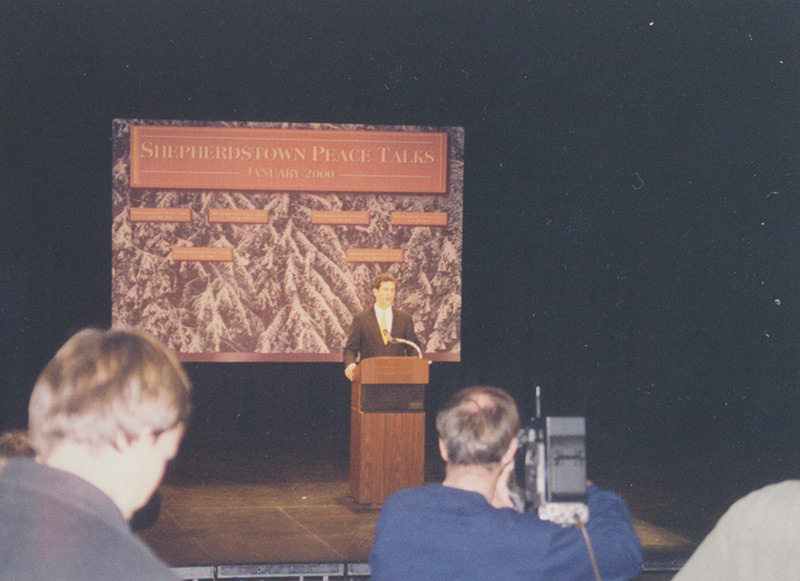 The national and international spotlight on Shepherdstown was soon extinguished, but the town became a footnote in the history of the early 21st Century.